One aspect of the low FODMAP diet that requires a fair amount of preparation is snacking. It can be hard to find snacks out and about which don’t contain wheat, problem fruit and vegetables, flavourings etc. For example in the hospital I work in we are very fortunate to have a fresh fruit and veg stall where you can buy a wide selection of in season produce which is a perfect snack…however what if you want something a little more filling? The only options in the shop and cafeteria are crisps…even most of the rice cakes are not suitable due to their flavour selection. Leaving your options pretty limited. This is why making a huge batch of low FODMAP flapjacks with nuts and dried fruits was an easy option to enable us to have some filling snacks during the week. These low FODMAP flapjacks have come in really useful to have in my bag between work and the gym. You can adapt the additional ingredients to your taste. I found that this amount was good, as they were full of extra flavour however still held together. 100g of nuts is quite a lot by the way. Anyway, be inventive! NOTE: Oats can be a confusing food on the low FODMAP diet. When analysed for their FODMAP content oats from different regions around the world are found to have different amounts of FODMAPs. For example oats (uncooked) are high in galactooligosaccharides (GOS) & fructans when using more than 78g in Australia, more than 100g in the UK and when more than 130g in South Africa. Also ‘quick oats’ are moderate in GOS & fructans when you have 47g. This recipe will make at least 10 flapjacks out of 300g oats i.e. 30g oats per flapjack. Therefore whatever type of oats you use out of the ones mentioned here you do not have to worry about them being high in FODMAPS. *We suggest you double check the Monash Low FODMAP Diet App for appropriate portion sizes of the dried fruit you wish to use and work out how much fruit you can add in to safely eat per portion size of flapjack. For example 100g of raisins is clearly high in FODMAPs (fructans) but divided amongst 10 flapjacks that is 10g in each and 13g of raisins is low in the FODMAP fructans. Roughly chop the dried fruits and nuts and add to a large bowl. To these, add the oats and sugar. In a pan, gently melt the butter and golden syrup and when liquid, add to the oats mixture. Mix thoroughly. Tip into the lined tin and spread evenly, pressing down firmly with a spoon. Bake for 20-25 minutes until golden. Remove from the oven and press down on the mixture to help bind the flapjacks.Cut into squares before it has cooled! Please do wait until the flapjacks have cooled and solidified before removing them otherwise they will crumble slightly. Additional extra: For a little more indulgence melt some dark chocolate and drizzle over the top to set. Two dietitians recently travelled around the world and blogged about following a modified low FODMAP diet. 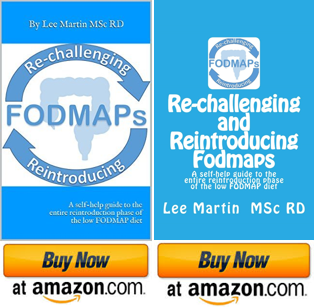 See more on the FODMAP travel section. Pingback: Low FODMAP Grocery Shopping: UK vs US - Well Balanced. Food. Life. Travel.